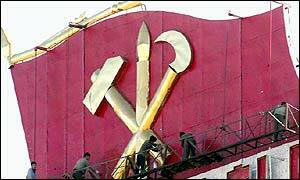 The hammer and sickle is a symbol used to represent communism and communist political parties. It features a sickle superimposed on a hammer. The two tools are symbols of the industrial proletariat and the peasantry respectively; placing them together symbolises the unity between agricultural and industrial workers. It is best known from having been incorporated into the red flags of the Soviet Union, along with the Red Star. Since 1917 the hammer and sickle (Russian: серп и молот, "serp i molot") was one of the symbols of the RSFSR. Initially it was rendered on the Coat of Arms of the RSFSR, the union of workers and peasants having been declared the base of the state, and on the symbolics of the Red Army (created in 1918). Later it was featured on the flag of the Soviet Union, adopted in 1923 and finalized in the 1924 Soviet Constitution, and flags of the republics of the Soviet Union after 1924. Before this, the flags of Soviet republics tended to be a plain red field, defaced with the golden text of the name of the respective republic, as stipulated in Article 90 of the 1918 Soviet Constitution. The coats of arms of the Soviet Union show the hammer and sickle, which also appeared on the Red Star badge on the uniform cap of the Red Army uniform and in many other places. The hammer and sickle, imposed onto a pair of stylised wings, was used by the Soviet national carrier, Aeroflot. Aeroflot of the Russian Federation continues to use the symbol. Serp i Molot is the name of the Moscow Metallurgical Plant. Serp i Molot is the name of a stop of the Gorky direction electrical train line from the Kursk Train Station of Moscow (featured in the Venedikt Erofeev's novel, Moscow-Petushki). Those Communist Parties affiliated to the Comintern and the Cominform (that is those who looked to Moscow) and also those who looked to Beijing for guiding leadership tended to employ the use of the hammer and sickle or similar designs in their symbology. Flag of Angola as of 1975. Symbols stylistically derived from the hammer and sickle appear on the flag of Angola, logo of the Communist Party of Britain, Communist Party of the USA, and on some renditions of Britain's Transport and General Workers Union logo. Further variations on the theme of crossed tools include the symbol of North Korea's Korean Workers' Party (hammer, pen and sickle), and the old symbol of the British Labour Party (spade, torch and hoe). In 1990, after Nelson Mandela was released from prison, he made a speech to the South African people from a balcony decked out with the hammer and sickle flag in Cape Town. The Communist Party of Guadeloupe uses a letter "G" in the style of a hammer and sickle on its flag  (http://flagspot.net/flags/gp-pcg.html#1998). Common Trotskyist usage is to reverse the symbol -- i.e., the handle of the sickle on the bottom right instead of the bottom left. In Unicode, the "hammer and sickle" symbol is U+262D (☭). Old symbol (http://www.l-r-c.org.uk/img/logo.gif) of the British Labour Party (spade, torch and hoe). This page was last modified 03:52, 8 Jun 2005. This page has been accessed 2990 times.